Your gutters and downspouts are two of the most essential components of the exterior of your home. If they are not functioning properly, your roof can be damaged. In addition, water damage can happen inside your home if your gutters and downspouts are not channeling water away from your home in the correct manner. Therefore, it is crucial that you take good care of them. Here are five tips for maintaining your gutters and downspouts. The number one thing you must do to maintain your gutters is to clean them regularly. Leaves, twigs, dirt and other debris collects in your gutters over time. 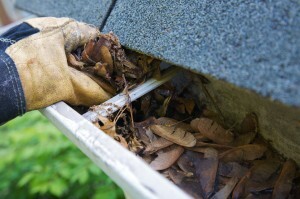 If you do not remove this clutter, your gutters can get clogged up. If this happens, it can cause water to back up onto the roof or overflow the gutters. At least twice a year, you need to get up on a ladder and remove all of the debris in your gutters by hand. The best times to do these biannual cleanings are in the spring and the fall. It is especially important to clean you gutters in the fall so that melting snow can run off your roof. Otherwise, the snow will simply melt and refreeze, which can lead to ice dams that severely damage your roof. After you have removed all of the debris in your gutters, you can then rinse them out with a hose to make sure they are completely clean and water is flowing out of the downspouts correctly. You must remove the debris before you turn the hose on your gutters. If you just try to rinse your gutters out with the hose from the start, it will often just create worse clogs in your gutters that are more difficult to remove. Sometimes, you will find that your gutters are clean but the water is not flowing out of your downspouts as it should. If this happens, you need to clear the obstructions that are blocking them. The best way to do this is with a plumber’s snake. When you are doing your biannual cleaning of your gutters, you should take time to inspect your downspouts along with your gutters. Check for wear and tear. Make sure there are not holes anywhere. Make sure all the seams are secure. If you see any rusty spots, use a wire brush to remove the rust, and then paint the scraped spots with a rust-inhibiting paint. While you are doing your inspection, you may come across sections of your gutters or downspouts that are severely damaged. If you don’t think you can repair the damage completely, it is always best to just replace the damaged section. If you find cleaning out your gutters twice a year to be a real hassle, you should think about installing gutter guards. Gutter guards are wire screens that fit over your gutters to keep debris from collecting inside them. The best gutter guards are made from aluminum so that they will not rust.